Podium Showroom Sample – Discontinued Cabinet Type. 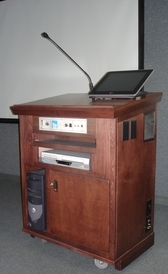 Integrated Computer Presentation Podium, Plug and Play Design, in Oak Cabinetry and Includes a Podium Top Mounted 15” LCD PC Monitor, a Wireless Keyboard and Mouse, Convenient Laptop and Audio Interconnect Input Connection, and is Completely Pre-wired for PC and VCR or DVD. VGA Data, Video and Audio Output Plate, A Shure Professional Grade Shock Mount Microflex Supercardioid Podium Microphone. Includes a 180 Watt Four Speaker Stereo “WrapAround” PA System with Auxiliary Microphone Input (Up to 4 Mic Capability With Internal (2) mic mixer inputs), and auxiliary audio input. Automatic Internal Source Switching. Finish is in Dark Cherry.